Our business has been around long enough to see the evolution of screen printing techniques. For over 30 years, we have provided the Ann Arbor area with the best in this service by learning the old and new ways of doing things. We have evolved with the industry, and have managed to stay on top. At Sunrise Screen Printing, we know the physical limitations of screen printing. It is not the best option for every product. However, we are able to do a wide variety of products and designs. If it can be designed on a screen printable product, then we can print it. No matter how simple or complex the design, you will be sure to walk away happy with your result. T-shirts and bags make up the largest sections of the screen printing side of our products. However, we also do a variety of others – including sweat shirts and sweat pants. Another growing part of our business are retail trade t-shirts. These are shirts of a higher end quality that you might see in a more upscale retail store. They are tri-blend and soft, and we are happy to enhance the quality of the shirt with the design of your choice! Most of our clients have a predetermined design or logo by the time they come to us to get their goods printed. They have either made it themselves, or have had a design company do it for them. If for whatever reason you cannot decide what you wish your brand logo to look like, you are in good hands with us. We can come up with a customized, marketable design just for you. For screen printing, we recommend the design be in one or two colors for reasons of pricing. The cost will rise substantially when three or more colors are involved. Our screen printed items can provide an invaluable keepsake for your family reunion. An attractive and memorable design for your company’s brand. Or a distinguishable uniform logo for your child’s sports team. 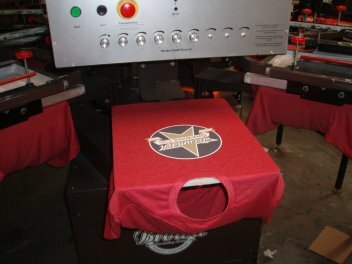 We screen print for countless industries, occasions, and people. In order to be absolutely sure that you will like what you have picked out, we would love for you to come in and see for yourself. That way, it will ensure visual purity. Looking at a designed logo online can have potential obscurities if it is taken in poor lighting, or potential variances in monitors. You can see the designs and assorted colors in person, which is how you and your clients will experience the eventual product. In addition, we would love to get to know you better! You can also see how our products are printed. We guarantee that you will be impressed at our efficiency and skill. This winning combination helps us keep our costs competitive while giving you a top quality product.